Charlotte 49ers head golf coach Adam Pry has hired former 49ers standout Andrew DiBitetto as assistant coach. DiBitetto, an all-America golfer and former Atlantic-10 golf student athlete of the year, was part of a historic 49ers class that became the first in school history to participate in four consecutive NCAA Tournaments. “Andrew’s experience as a highly successful student-athlete, a professional golfer and assistant coach made him the ideal candidate for the position," Pry said. 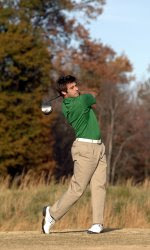 "As a former team member, Andrew is passionate about UNC Charlotte and the Charlotte 49ers golf team. DiBitetto, who served as an interim assistant coach for the 49ers in the spring of 2009, was named an honorable mention all-America as a junior in 2007 after leading the 49ers to a tie for third place at the NCAA Championship. He posted a career stroke average of 73.04, finished in ninth place at the NCAA finals, the best-ever finish by a 49ers golfer. “In my years here as a student-athlete, it was obvious that this athletic department does things the right way and for the right reasons, while having fun doing it," DiBitetto said.